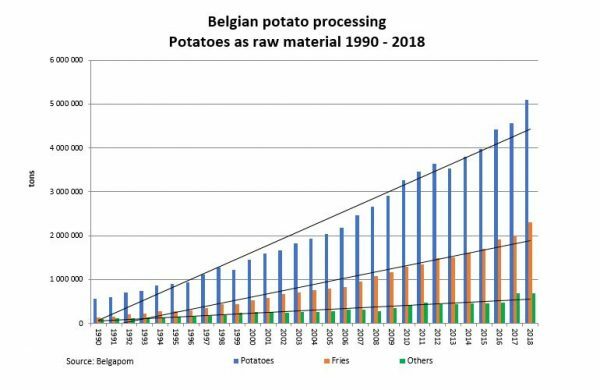 Belgapom, the association for the Belgian potato trade and processing industry, can announce that in 2018 the 5 million tonne mark was passed with regard to processed potatoes. This is absolutely a new record and what makes it even more remarkable, is that it is the sharpest annual increase since the nineteen-nineties. As a reminder: in 1990 around 500,000 tonnes of potatoes were processed into fries, mashed potato products, crisps or flakes and granules. 28 years later, the sector can report an increase of 1000 %. In the meantime, Belgium has become the largest exporter of frozen potatoes in the world, exporting to over 150 countries. The term ‘Belgian fries’ is part of our country’s international food image of chocolate, beers and fries. But the entire Belgian potato chain helped develop the growth: in addition to the farmers, for whom potatoes have become the most important source of revenues within arable farming, service providers and suppliers of machinery also experienced remarkable growth. They are increasingly also becoming global players with innovative products and technology. The use of potatoes as a raw material rose by 11.6% in 2018. This is by far the sharpest increase in the history of this still relatively new sector of the Belgian food industry. The sector continues to invest in the future, both with regard to quality and quantity. Sustainability is the leitmotiv through it all. Efforts are being made in the area of the sustainable cultivation of potatoes, environmentally friendly production and logistics. Employment has also seen remarkable growth with an increase of 8 % compared to 2017. At present, 4762 blue and white-collar workers are employed in this strongly automated sector. And for the future, too, the ‘sustainable growth’ of the Belgian potato-processing sector is guaranteed, since in 2018 there were once again record investments in the sector for the sum of almost 311 million euros. The reasons for this remarkable evolution are firstly the continued increasing demand for potato products on the world market. 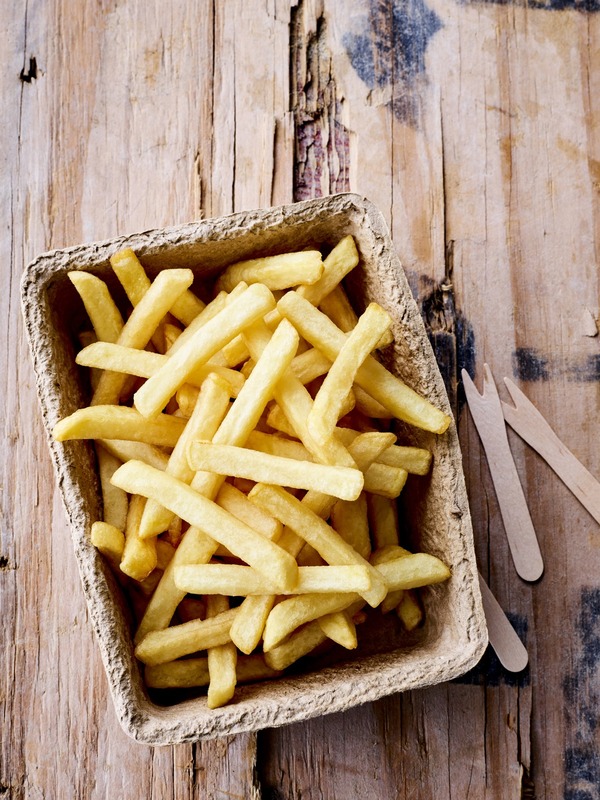 The ever-growing middle classes in Asia and South America is stimulating the demand for convenience food, including Belgian fries. The Belgian potato-processing industry is located in the heart of the European production area and it can make use of an ever more number of potato professionals and a unique logistical network with international ports nearby. On the other hand, the Belgian potato sector has made use of the large supply of potatoes in the second half of the 2017-2018 season following a record potato harvest. Despite the setback of the 2018-2019 growing season with the exceptional drought and repeated heatwaves, there was a large supply of potatoes in the second half of 2018. Quite a number of batches could not be kept and – in consultation with the growers – it was decided to process them in the autumn of 2018. In addition, the Belgian processing companies are also increasingly investing in promotion and developing their commercial network. One example of this is the campaign in southeast Asia in cooperation with VLAM and APAQ-W and the European Commission, that has led to better familiarity with the story of ‘Belgian fries, from the heart of Europe’ in that part of the world too. Within the framework of sustainable development of the sector, Belgapom and its companies want to offer their full support to VITO’s WatchITgrow platform. This instrument, that makes use of satellite data and numerous other information sources, is the successor to the Belspo Ipot project that Belgapom helped to set up. Belgapom has called on its members to pay producers who, within the framework of their contract enter their parcels via WatchITgrow before 2019 and add the necessary cultivation data, a premium for this. The data is used by VITO to develop growing advice controlled by AI (artificial intelligence). For the next 2 years, growers can make use of the online growing advice that will be further developed year after year. After that, a fee will be charged for the system, but it will also continue to further develop its advice and warnings. Access to the harvest prognosis model is limited to just the grower – who is free to share it with his buyers if he wants to. It is important to point out that VITO is the only party who has access to this data.